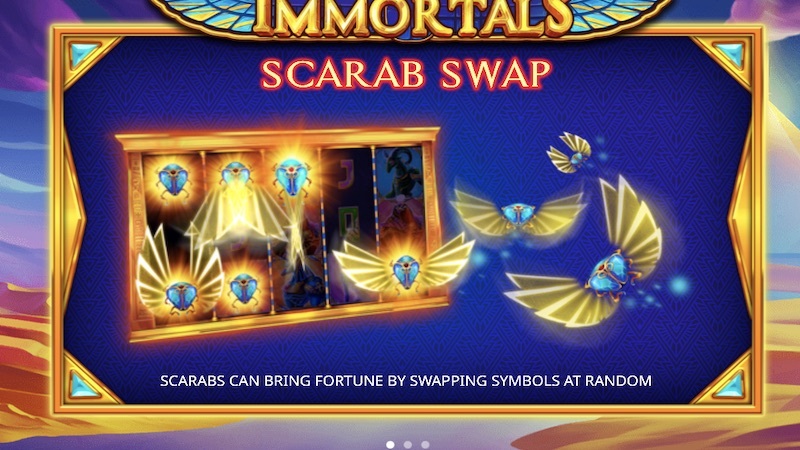 Book Of Immortals slot from iSoftBet is one of their latest games and another based on ancient Egypt and their Gods. This one, however, is more of a low variance slot meaning that payouts tend to be more frequent but a bit lower. If that’s not something you particular like then you might want to look elsewhere. Free Spins Bonus. Like most of these types of Bonuses, it’s triggered by 3 or more Scatter symbols shown as the Scarab symbols. If you land 3 of them in any position across the reels you’ll be given 10 free spins along with 2x your total bet. You know, to really reward you. 4 Scatter symbols will also give you 10 free spins by 20x your total bet. Finally, 5 Scatter symbols will give you 10 free spins but a most impressive 200x your total bet. As well as some free spins and an initial payout, Book Of Immortals slot will choose a special symbol shown on the top reel. After initial payouts, the special symbol can then expand and form wins on all 10 lines on non-adjacent reels. After an expanded win, the top reel will then move and choose another symbol. If the chosen symbol is a God symbol it will become immortal. This means it can expand for the whole duration of the Bonus to give you some nice wins. You can also win more free spins if the Extra Free Spins symbol is selected on the top reel. Scarabs Swap. On any paid spin, this feature can be triggered and a swarm of scarabs will fly across the reels, landing on up to 10 symbols. These symbols can then be switched to hopefully give you a better win. 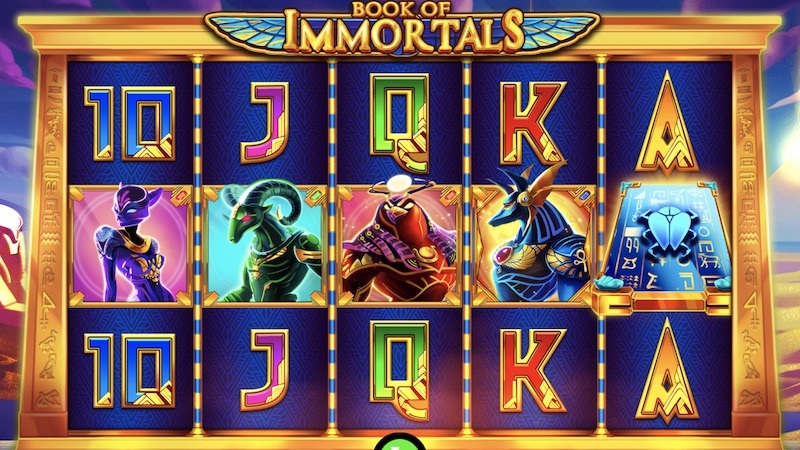 Book Of Immortals slot is a brand new game from iSoftBet and despite having only 10 paylines, it attempts to draw you in with it’s features of which there are basically 2. One is the Free Spins Bonus, of course, which gives you a special symbols that can expand to fill the entire reel. Furthermore, is this is a God symbol then it will expand permanently throughout the Bonus so give you more wins, and higher value ones at that. The other Bonus is smaller and more just to keep things a bit more interesting. Unfortunately, I think this game is a little dull and could do with another couple of features, as well as a more exciting design as this theme has been used so many times and this one just doesn’t stand out. It’s not a bad slot, but it’s just not exciting enough for me to recommend. That being said, if you enjoy it please let us know down in the comments section below. You can also check out some of iSoftBet’s other slots here. Could do with another feature.